When I studied in-depth the causes for falling dosages in Champagne over 21 years from 1991 to 2011 for my Master of Wine dissertation, it was found that climatic influences were not the main agents of change. While measures over the study period showed that there was an increase in berry ripeness, the primary factors for such change were related to improved vineyard management, weather monitoring, and harvesting, rather than a warming climate. Among the main changes contributing to riper, healthier grapes in Champagne since the 90s has been higher trellising (bringing more foliage and therefore sugar accumulation in the berries), along with less nitrogen fertiliser application, and an increase in competition for nutrients due to greater vineyard grass cover, which in turn has yielded thicker-skinned, more disease-resistant berries. A further important change concerned the more comprehensive analysis of the grapes before harvesting, and, as a result, a decision to pick later – which was, in turn, made possible by more disease-resistant berries, as well as better disease monitoring/control in Champagne. So, if those were the main reasons, what was the impact on grape musts? Well, looking at data from 1991 to 2011, my study showed an average drop in total acidity of 8.5% and rise in potential alcohol of 4.1%. Interestingly, according to de Varine last week, it is riper grapes in general that are fuelling a rise in demand for Chardonnay in Champagne – a topic previously highlighted by the drinks business. This is because, he says, Chardonnay brings “more freshness and salinity” to blends, offsetting, in particular, the “soft” wines from red grapes grown in the region – which make up the majority (Pinot Noir and Meunier account for around 60% of the planted area of the appellation). “We need more Chardonnay to provide a backbone,” he said. As for Gosset’s new Blanc de Noirs, which uses Pinot Noir from the 2007 harvest as its base, he recorded his technique to bring greater perceived acidity to the wine. “We use the Chardonnay lees to bring freshness to our Pinot Noir,” he said, explaining that they are added while the red grapes are fermenting. Not mentioned by de Varine, perhaps because it is true for all Gosset Champagnes, but the producer also blocks the so-called malo-lactic fermentation (MLF), which sees the fresh tasting malic acid converted to softer lactic acid in the base wines used to make the fizz. Today, relatively few maisons prevent this conversation, and well-known names that retain the malic acid in their Champagnes include, along with Gosset, Lanson, Alfred Gratien and Krug. Of course my dissertation also considered the climate of Champagne during the recent past, and it was shown that the region has seen a rise in average temperature of 1.3°C over the last 30 years to 2013 (as measured by the CIVC weather station at Épernay, 2014), while the worldwide rise was about 0.5°C over the same period (NASA, 2014). As my study pointed out, the climate change in Champagne is more marked if one goes back to the 80s, which was a cool decade in Champagne, with very hard winters in 1985, 1986 and 1987, with grape harvests beginning in late September and wine struggling to reach an alcoholic strength of 9% (CIVC, 2014). Not until 1988 did average temperatures in Champagne rise, though there were considerable swings either way. Although Champagne has enjoyed a series of warm vintages in the noughties, average potential alcohols are still not high enough for winemakers to stop chaptalising musts – it is said by winemakers that an average potential alcohol in the grapes of 10.8% is the minimum necessary for unchaptalised must in Champagne. (The highest average potential alcohol level in the last decade (10.6%) was seen in 2003). Indeed, one respondent stated anonymously in my survey: “Champagne can accept slightly higher temperatures without affecting cultivation or the wines”. Neither myself nor de Varine are denying the existence of climate change in Champagne, but his comments last week were a rare example of a winemaker pointing out that the main cause of riper musts in Champagne is improved vineyard management, which means that the changes to berry quality, pH and sugar levels are within the grower’s control – that is, for now. 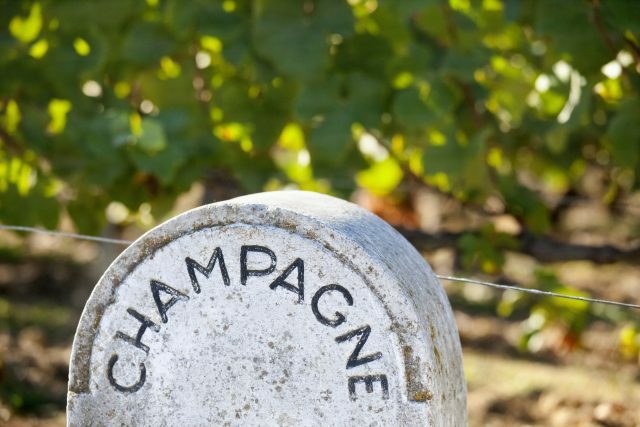 Finally, it should also be noted that cleaner and riper grapes – along with longer lees ageing times – have improved the general quality of Brut Non-Vintage Champagne, which accounts for around 90% of the region’s production. In other words, riper grapes are yielding better Champagne at its most commercially-significant level. As previously reported by db, Gosset’s new blanc de noirs has been produced from 100% Pinot Noir sourced from grand and premier cru vineyards, primarily from the 2007 vintage. Aged for nine years on its lees the wine did not go through malolactic fermentation and has a dosage of just 5g/l, making it an ‘extra brut’ in style. Just 10,000 bottles have been made as a “one-off”, according to de Varine. “We are considering that there is a difference in climate since 1988. When I was a child my parents harvested 1 year out of 2 in October. Since ’87 we have harvested only 3 times in October. In 87, 91 and 2013. This means the climate has changed. Another thing, in the last 15 years we began the harvest 3 times in August, in 2003, 2007, 2011.